IGHI’s May Forum gathered to discussed how healthcare is impacted by conflict. Apply for an all expenses paid trip to China for a workshop on mental health technologies organised by the Hamlyn Centre. Registration is open to join the International Decision Support Initiative’s Health Technology Assessment Toolkit consultation process. 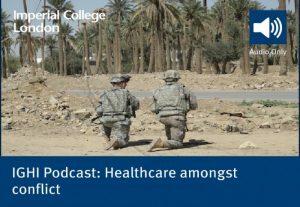 In this month’s podcast from the Institute of Global Health Innovation, we speak to Dr Esmita Charani, Senior Lead Pharmacist, Faculty of Medicine and Dr Emily Mayhew, Visiting Researcher and Imperial’s lead on the Paediatric Blast Injury Partnership. Registration now open for International Robotics Showcase in Liverpool. One-day showcase and speaker programme to highlight latest robotics innovation, to be held during International Business Festival. Join us on 13 June for our Global Health Forum with a focus this month on the burden of trauma due to road traffic injury and how big data is helping to improve insight on this topic worldwide.